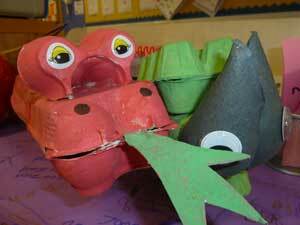 To raise money for Red Nose Day, the pupils of Arngask PS spent their homework time creating a dinosaur or a volcano. They used the knowledge they had gained in school about the different types of dinosaurs, how they lived and what they ate. But they could also use their imagination when it came to what colour they were. 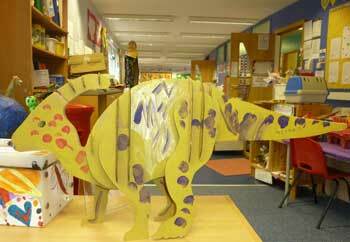 The dinosaurs were taken into school for Red Nose Day, to show to their teachers and their friends. The pupils then wrote about how they had made the dinosaur. And on the next Cafe afternoon (Tuesdays) the dinosaurs were displayed in the Hall and the Cafe for everyone to see. If you missed them, see the photos now. Didn’t they (and their parents) have fun! And don’t forget next term that the school’s Cafe is open every Tuesday afternoon at 2pm. Everyone is welcome to drop in for tea and cakes made by the pupils.